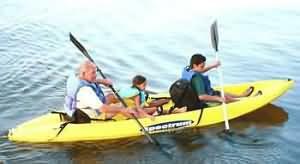 Kayaking is great family fun. Be sure and pick a nice calm day if you are taking small children. Be sure everyone has a life preserver, and observe the beach safety flags. Most area beaches will have a vender who rents kayaks. Sit on top kayaks like the one above are safe and user friendly if you observe safe boating practices. Kayaking is a fun sport Sit on top kayaks are safe and easy to handle. Most beach concessions in the Destin area have them. Most people prefer to kayak on nice calm days, especially with small children. Like sailing, kayaking can be an extremely relaxing activity, or with a little ingenuity it can become a white knuckle affair. Many experienced kayakers like to surf kayaks, and pray for surf. As in regular surfing, it's best to pick a day when the surf is fairly small when getting started. You will want a good PFD, and a white water helmet. Please observe beach warning flags. Kayaking is safe sport, although there are risks involved. If you look closely, all of the kayakers here are wearing proper safety equipment, life jackets or PFDs, (Personal Flotation Devices), and safety helmets. PFDs are required equipment. You have to have one. You should also study the water conditions carefully, and observe the beach safety flag system.